'How can I access funding?' is one of the most commonly asked research-related questions. It isn't easy, is the simple and honest answer. When you are starting out in research, it helps to align yourself with someone who is already established and preferably, who is working in the research area that you are interested in. Remember, it is not always necessary to have funding to conduct small research projects. What is essential is enthusiasm and time. It is important to make contact with your Research and Development unit manager to talk through your research ideas and aspirations. They will have information about local as well as national funding options including access to any in-house pump priming or capability funding. For many AHPs, formal research training may be an option and this can include access to funded MRes places through the NIHR programme and access to funding for PhD work through fellowship and Clinical Academic Training schemes. For further guidance on funding please click here. The National Institute of Health Research (NIHR) and Health Education England (HEE) have launched two guides to support healthcare professionals to develop clinical academic careers. The Cheshire & Merseyside AHP Research Network regularly offers bursaries to facilitate small scale research studies conducted and led by AHPs. These are only open to AHPs (registered with HCPC) who work in the Cheshire & Merseyside region. The research activity must be undertaken within the Cheshire & Merseyside region within health and social care settings. The applicant is expected to complete a small research project and provide a written report of results. Examples of suitable studies may include pilot work (small scale preliminary studies) and proof of concept (feasibility studies collecting and analysing data to obtain evidence to support or refute ideas or plans). Preference is given to projects that incorporate patient and public involvement and for clinical projects over education projects. Only direct costs can be covered by the bursary. The applicant is expected to forge a link with their NHS Trust Research office and establish a mentor within the Trust, who will be able to provide support. 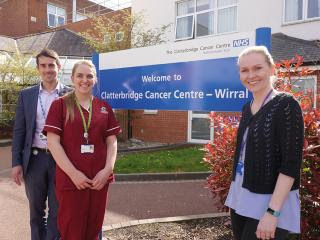 Radiographers from the Clatterbridge Centre - Nicky Hutton, Jenny Callender and Danny Hutton - were awarded funding by our hub during 2017. The award will allow the team to develop their feasibility study, which evaluated the introduction of micro-enemas to reduce rectal volume variation in patients receiving bladder radiotherapy. The next phase is to quantify the relationship between rectal volume and bladder deformation. This will be done by a retrospective analysis of around 500 Cone Beam CT datasets and comparing to the reference CT dataset. Using imaging techniques for soft tissue visualisation will allow the team to establish the coincidence of the planned bladder volume and the treatment bladder volume. "There is potential for improved outcomes for patients," said Danny Hutton. "Quantifying and reducing the deformation of the bladder may allow an increase in the treatment dose whilst reducing irradiation of healthy tissue, therefore reducing side effects. "We would encourage colleagues to apply for funding. It's a really useful exercise to have your proposal and methodology critiqued by experienced researchers to challenge your thinking."